This is a delicious and moist fresh coconut cake with fluffy frosting. Make this cake as a special dessert for Easter, Christmas, or other special dinner or family gathering. Basic variations include ​sour cream coconut cake and strawberry coconut cake. Note: while there are multiple steps to this recipe, this coconut cake dessert is broken down into workable categories to help you better plan for preparation and baking. Grease 2 (9-inch) round cake pans; line the bottoms with rounds of parchment paper or waxed paper. Grease and flour the paper and sides of the pans; set aside. Heat oven to 350 F.
Heat the coconut milk with 1/2 cup coconut and the 1 teaspoon vanilla until hot. Put in blender and process until coconut is finely chopped. Set aside. Sift the cake flour into a bowl with the baking powder and salt; set aside. In a bowl of electric mixer, beat butter until light and creamy. Gradually add the 1 1/2 cups sugar, a few tablespoons at a time, scraping the bowl and beating for about a minute after each addition. Add the 3 eggs, one at a time, beating well after each addition, scraping sides of the bowl frequently. Slowly, add about one-third of the flour mixture to the creamed mixture, along with half of the milk/coconut/vanilla mixture. Beat on low speed until blended. Scrape the bowl and repeat with another one-third of the dry mixture and the remaining milk mixture. Scrape the bowl and repeat with remaining flour mixture. Scrape the bowl and continue beating on low speed for a few seconds. Spoon batter into the two baking pans, spreading evenly. Bake for about 30 minutes, or until browned and sides pull away from the sides of the pans. Invert onto racks which have been sprayed with a little nonstick coating to cool completely. Bring the 1/2 cup water and 1 cup sugar to a boil; cover and cook without stirring for 1 minute. Uncover and boil, stirring frequently until mixture is hot enough to spin a thread when a little is dropped from a spoon, or to about 230 F. Remove from heat and set aside. In the bowl of electric mixer -- with whisk attachment if available -- beat the eggs until fluffy and soft peaks form when you lift the beaters or whisk. Still beating on high speed, gradually add the sugar syrup in a thin stream. Continue beating until the frosting is fluffy and holds peaks. Invert one of the cakes onto a serving plate. Frost top and sides with frosting. Place the second layer atop the first and frost the top and sides liberally. 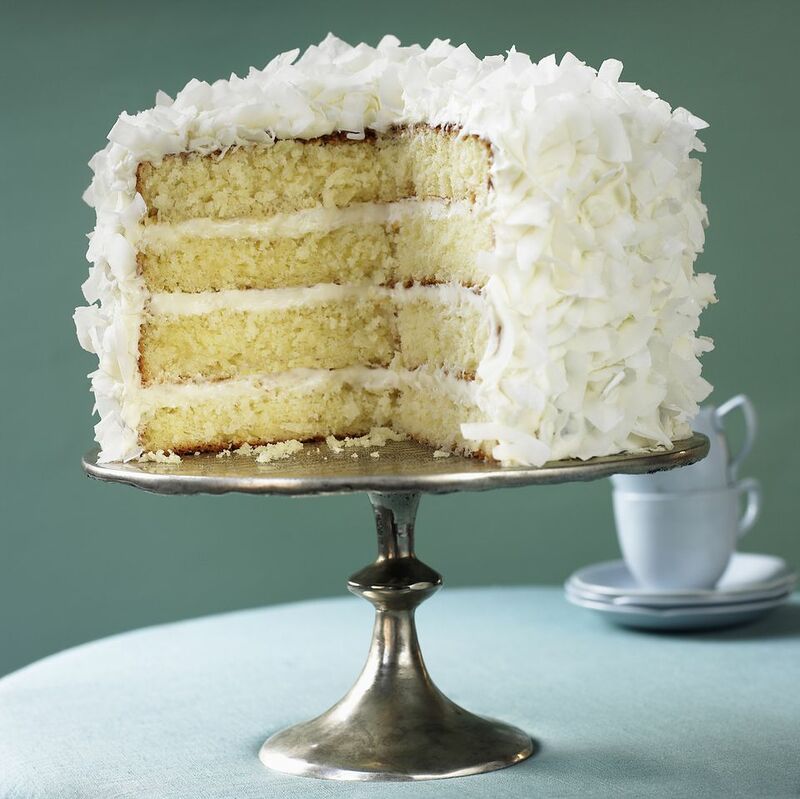 Sprinkle the freshly grated coconut over the top of the cake and toss coconut gently onto the sides.